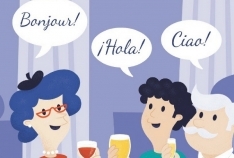 Lovely, lively Spanish lessons for adults. - in small groups so everyone can join in. - or put anyone on the spot. Please get in touch for more details. I would love to hear from you. If you're looking for an 'improvers' class, let me know! This course is for people who have either done Beginners 1 or remember basic greetings, introductions, describing where you live and asking for something in a shop. Beginners 2 covers useful vocabulary and conversations including asking for directions, opening hours, places in town and ordering in restaurants. The classes will start on Tuesday 18th September between 5:45pm-7:15pm at Bar Catalan, Warwick. This class is aimed at those who have studied Spanish before, albeit some time ago, or maybe more recently but you need support to converse in a relaxed and friendly atmosphere. The classes will start on Tuesday 18th September between 7:30pm-9pm at Bar Catalan, Warwick. This course will start on Thursday 20th September (FREE taster class on Thursday the 13th September!). Every Thursday between 7:30pm-9pm at Habano in Leamington Spa. You will learn to talk about yourself in Spanish. You will learn how to greet people; to talk about where you are from; what family you have; what you would like in a restaurant; days, months and weeks; ways to help you understand what people are saying and a few of the important verbs. Social Event in Warwick	Social Event and Taster Lesson coming soon! Hola, my name is Maria. I live here in Warwick but I was actually born and grew up in the city of Valencia, Spain. My mother tongue is Spanish but I am now fluent in English too, after studying Linguistics and Literature before moving here in 2011. I have a passion for languages and I have taught them both here and in Spain since graduating. The best thing about learning a language is the ability it gives you to explore new cultures and connect with people who are from a very different background to you. Spanish is perfect for this, as the language is spoken across most of Latin America as well as Spain and many of the UK’s favourite holiday destinations! I am incredibly excited about passing on my love of learning a foreign language and that’s why I joined Language for fun. I hope to meet you soon - ¡Hasta pronto!